Forcing yourself to come up with new recipes based off a single ingredient/concept can be difficult. Forcing yourself to come up with two new recipes every week is stressful. Trying to do all of this with a full time job and a slowly dwindling number of daylight hours probably isn’t the best idea. However… I do like the idea of having a theme each month that I can contribute to. Rachel over at The Chic Site does it with a new color every month on her Instagram, and I think I can do the same thing with food. I already know what October’s is going to be (and no, it WON’T be pumpkin) so you’ll have to wait and find out on 10/1. 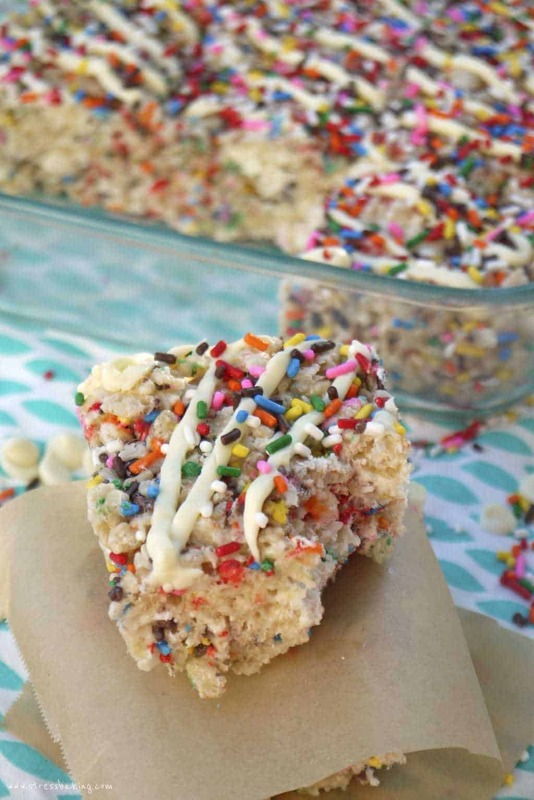 Now onto more important things, like these Funfetti Rice Krispie treats. 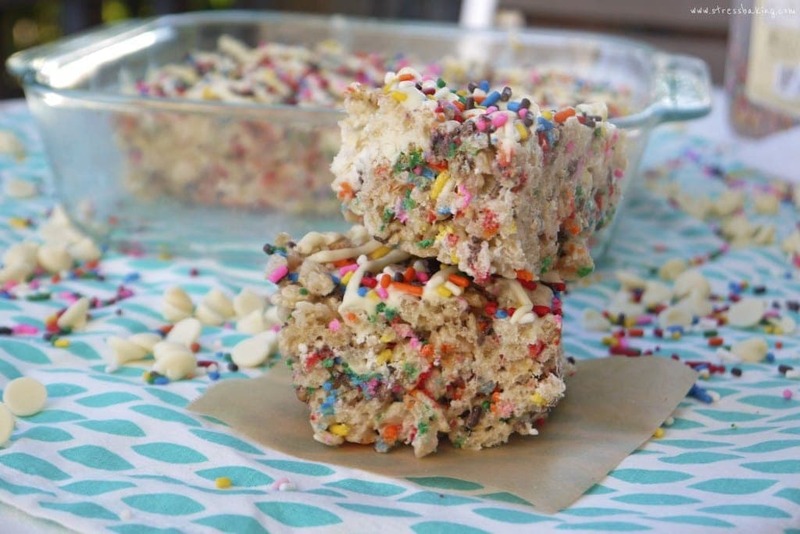 I took your normal, every day, ho-hum krispie treats and added a kick of white chocolate and a crapload of sprinkles. 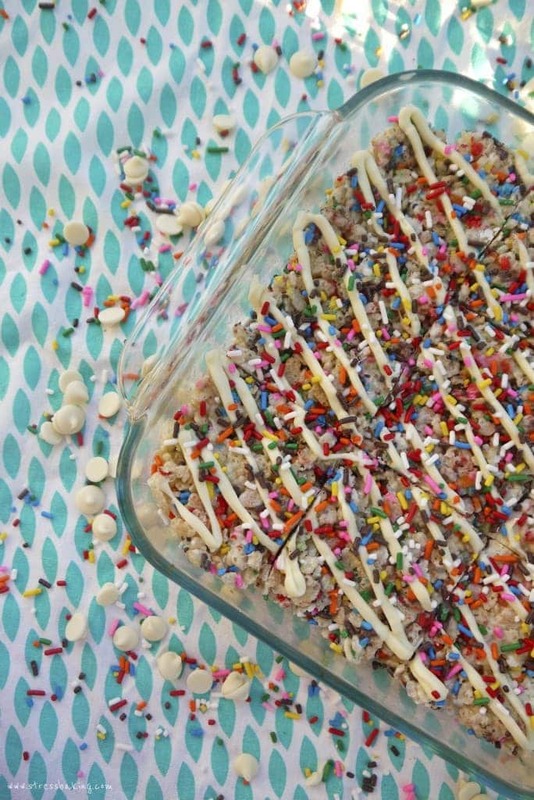 And then I of course topped it with even more white chocolate and sprinkles. Don’t even try to act like you’re surprised. Do not try to speed up the process by melting the butter and marshmallows over high heat. That will just end up changing the overall consistency of the treats and they’ll be hard as rocks. Trust me, you do not want this. Only melt them together over low heat, stirring constantly. Just be patient. 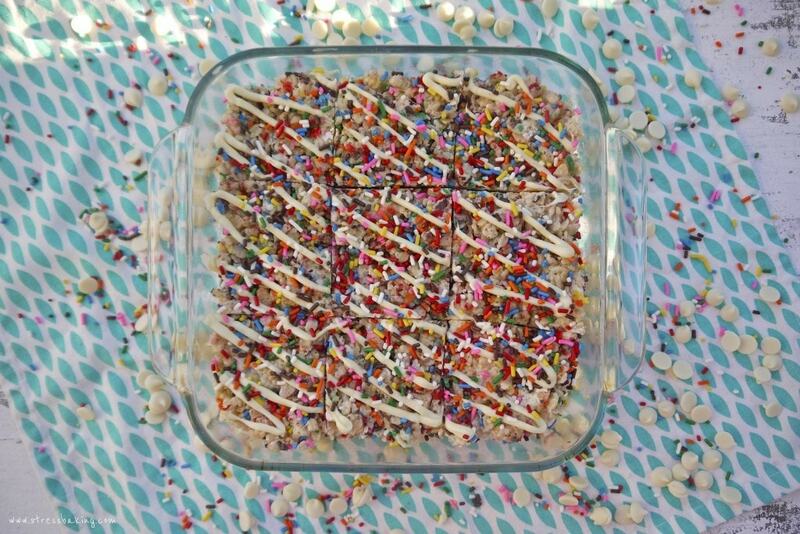 Don’t use nonpareil sprinkles – they’ll bleed all over and turn the treats brown. 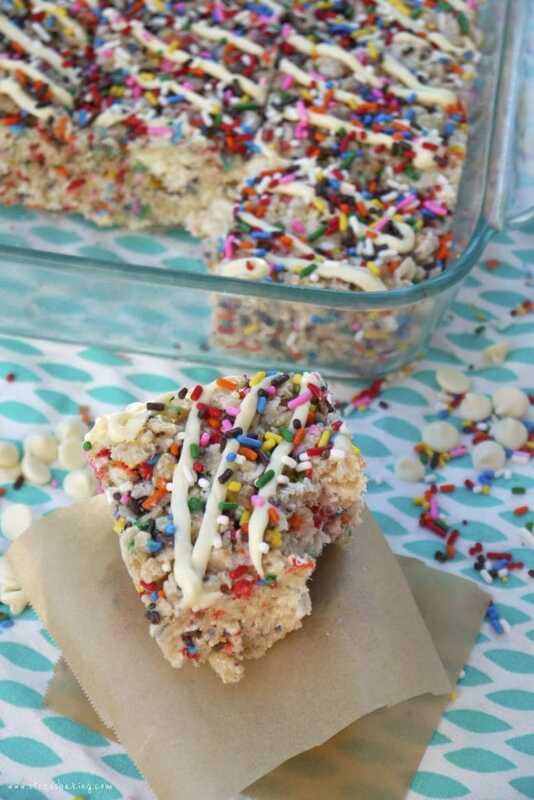 It’s gross and no amount of white chocolate drizzle will make them more appetizing. Sure, they’ll still taste good – but we all know if they’re the color of puke no one is going to want to check the taste. I make mine in an 8×8 pan because I like them thick, but you can always make them in a 9×13 instead – they’ll just be thinner. 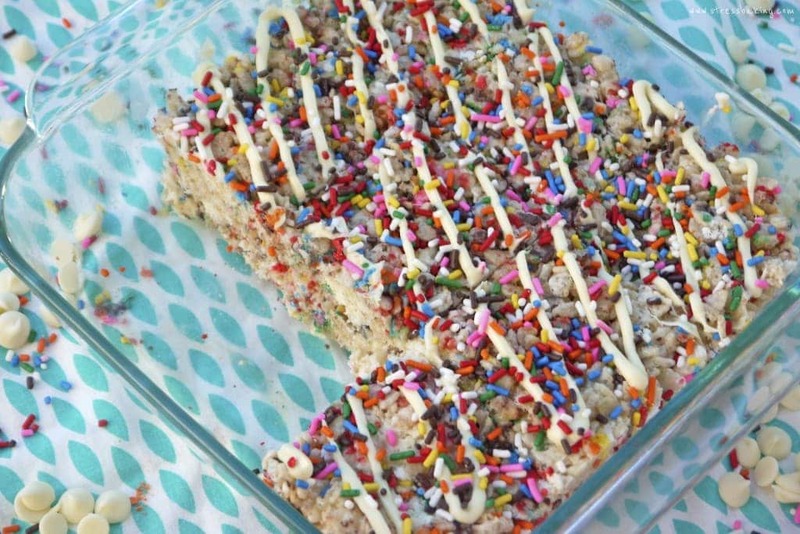 Or you could double the recipe so that they’re thick and you have twice as many bars. Cut them as big or as small as you want – the world is your sprinkle… er, oyster!